Press the meat mixture into a 9x5-inch loaf pan. In a small bowl, stir together remaining mustard, ketchup and brown sugar; pour on top of the meat loaf. Bake in the preheated oven until an instant-read thermometer inserted into the center reads 165 degrees F (74 degrees C), about 2 hours. My husband loved this! Best meatloaf that I have made by far. I substituted 1/2 c of oatmeal instead of bread crumbs and it turned out great. Meatloaf had no real texture, too much moisture. Prefer it with crackers rather than bread. This will be my new meatloaf recipe. 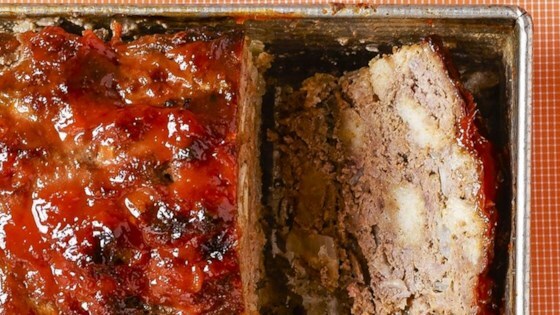 Meatloaf was very good, moist, and easy. I used about 1-1/2 t. of Lawry's seasoning salt instead of plain salt.